Emanuel and The Fear continue to expand their horizons and win over new fans with a multi-faceted sound that references classical music, bluesy barroom rock, folk, and indie pop. On this Monday night at the Knitting Factory, the band was hosted by the Onion A/V Club for a showcase that featured The Silent League and NYCTaper pals Dinosaur Feathers. Since we last saw the band, they have debuted their new full length album Listen, which delivers on the promise of their lauded first EP. This set gave ample coverage to the many different styles this 11-member band is capable of, including a new solo number by Emanuel Ayvas called “Drinking Song,” as well as many of the standouts from the 19-track Listen. Thanks to Paper Garden Records for hosting us at this event. I recorded this set with a four-microphone rig that perfectly captured both the room and the direct sound from the PA system. You can stream the entire show below, and the files have been properly tagged for importing into iTunes or your favorite music player. Enjoy! 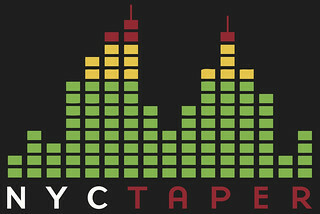 If you download this recording from NYCTaper, we expect that you will PLEASE SUPPORT Emanuel and the Fear, visit their website, and purchase their first full-length, Listen, from Paper Garden Records here.